There are some aspects of everyday life that we take full advantage of daily, but we really don’t know much about them. This is true for inventions such as the poly bag, which you are probably not familiar with. Here is all the information you need to become the new poly bag expert. Poly bags (polyethylene bags) are found in abundance in a multitude of industries, and are employed in a great variety of uses. For instance, industries related to clothing, such as sewing goods, apparel, and fabric companies, use poly bags to guard their products against dirt and moisture. Poly bags are available in many different varieties, including flat poly bags, poly bag tubing, resealable, wicketed, and gusseted poly bags, garment bags, poly film, poly sheeting, and self-sealing bags. For products that are generally lightweight and have simple protection needs, a poly bag of lighter density will do the trick. For goods that may experience rough handling, or may have greater exposure to damaging elements such as debris, moisture, or dirt, poly bags of a higher density make are recommended. Depending on specific needs, like keeping out moisture and needing an ease of access, resealable poly bags can readily fill both needs. Bag shape is another aspect to consider when selecting the best bag for your product needs. Flat poly bags are an excellent option to achieve a clear display of goods while maintaining low expenditure. When shape and style are key factors for use, a gusseted or wicketed bag will do a good job. For businesses that deal in clothing and attire, garment poly bags are perfect for shielding pants, coats, shirts, suits, etc. from the elements, while fitting their shape. Some companies that turn out vast quantities of product will find that a roll of poly film or tubing best suits their needs. Poly bags are easily customizable with your company logo, address, or any other information you would like to include on the bag, not to mention that they are highly versatile in form, size, and function. 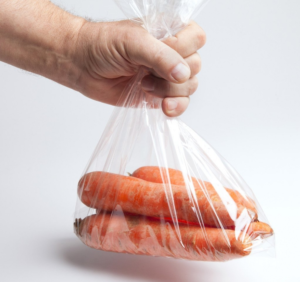 This fact, paired with the relatively inexpensive cost of buying the bags in bulk, means that your packaging worries have the potential to be addressed in one convenient bundle of poly bags. Choosing plastic bag packaging comes with an excellent array of benefits that can extend to your clients and the environment as well. It is common knowledge that, in general, households stash plastic bags that have been carried home with purchases from businesses like yours. Once in a home, customers gladly use them for their own needs, and are able to recycle them. Encouraging your customers to recycle their bags is a great choice for the environment, as plastic bags take less energy to make, transport, and recycle than paper bags do. You can even print a recycling reminder right on the bag. Overall, poly bags do a phenomenal job when it comes to product packaging. The protective qualities keep your products in top shape, while also advertising your goods and business. Throw in a highly versatile nature and low expenditure in bulk, and the poly bag might just be the best packaging option to date.